Leading innovation that puts you first. MCI models keep you moving ahead, starting with our industry-leading J-Series, now featuring two great models: the J4500 and the compact new J3500. Both offer best-in-class interiors, trim, lighting, and available passenger space, plus design improvements including electric cooling fans and swing-out radiators. Welcoming a new era of accessibility, the all-new D45 CRT LE features a patented Low Entry Vestibule that more easily accommodates multiple passengers with mobility devices. Other MCI innovations include ADAS (Advanced Driver Assistance Systems) featuring collision mitigation upgrades to detect and stop for stationary objects and more; along with a new optional 360-degree camera. And looking to 2020, our CHARGE long-range battery-electric models are already setting benchmarks in testing. Plus, you can count on MCIâ&#x20AC;&#x2122;s leadership in parts, service, support and training. From the tried and true to the bold and new, we are Reliability Driven. WHO’S DRIVING THE BUS? YOU ARE. When you choose Freightliner Custom Chassis, you get the power to customize your transportation to meet your needs. And with its reputation for durability, reliability, automotive styling and maneuverability, the S2C chassis is the premier choice for public transportation, resort and hotel shuttles, day-tour operations, armored and utility applications, and any business with special transport needs. Built in Gaffney, South Carolina by American workers, FCCC chassis are backed by the engineering and manufacturing excellence of the Daimler Group. This gives you access to the industry’s largest factory-certified service network, ensuring maximum uptime and hassle-free maintenance. Specifications are subject to change without notice. Freightliner Custom Chassis Corporation is registered to ISO 9001:2008 and ISO 14001:2004. Copyright ©2016 Daimler Trucks North America LLC. All rights reserved. Freightliner Custom Chassis Corporation is a subsidiary of Daimler Trucks North America LLC, a Daimler company. 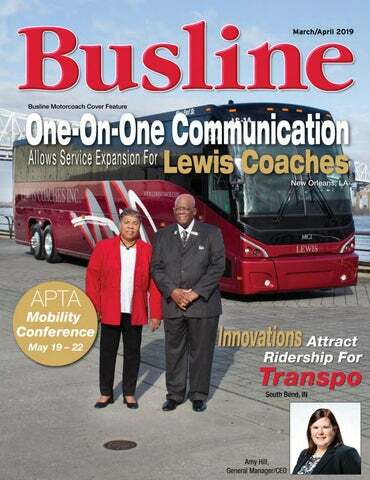 ON THE COVER: Officials at Lewis Coaches include Barbara Lewis (vice president) and Harold Lewis Sr. (president). They are shown next to one of the company’s MCI motorcoaches. The business is based in New Orleans, LA. See page 8. OUR WHOLE COMMITMENT TO OUR CUSTOMERS IS GREATER THAN THE SUM OF OUR PARTS. Our top priority is keeping your coach or bus running in top form. So we make getting replacement parts fast & easy. Simply order online from our complete parts catalogue, anytime, day or night. We offer same-day shipping on orders, and we have OEM specs for all our brands, to ensure you find exactly what you are looking for. We even carry parts for other brands. It simply couldnâ&#x20AC;&#x2122;t be any easier. CALL 1-847-844-7680 prevostcar.com Supported by the Prevost Parts & Service network. INDEPENDENCE is a compact system that provides the majority of the benefits of hybrid and battery-powered buses without the upfront costs and expensive hybrid battery replacement – all the while reducing operational and maintenance costs. If you’re ready to declare independence from conventionally driven accessories and transform your bottom line, call us at 1.800.227.6937. Safe. Reliable. Sustainable. With 100% Battery-Electric buses, trucks, and forklifts BYD is building your dreams of a cleaner future. Pictured, left to right, are Lewis Coaches' representatives Chad Lewis, Barbara Lewis, Harold Lewis Sr., and Harold Lewis Jr.
our generations of family involvement has led Lewis Coaches, Inc., to nearly 60 years of providing successful transportation services, first in the school bus segment, and later charter and tour work. Due to the Lewis family’s history of hard work and dedication directed toward its customer base, the company has been able to expand its service region over the years, from primarily its hometown of New Orleans, LA, to many locations throughout the southeastern part of the United States. “According to my calculations, anywhere from 65 to 75 percent of our business stems from repeat customers. That makes a big difference in our company’s success, especially when it comes to adding to our fleet of motorcoaches and transportation services,” said Lewis Coaches General Manager Harold Lewis Jr., a member of the family’s third generation involved with the company. “When operating our business, it helps to know that we can count on the majority of our customers to come back for more, due to our service, quality of drivers, etc. Barbara and Harold Lewis Sr. stand with some of their grandchildren: front row, left to right, Darius Lewis, Logan Lewis and Caleb Lewis; and top row, left to right, Donovan Isom and Braden Lewis. (Inset) As a symbolic gesture, itâ&#x20AC;&#x2122;s common for each of the familyâ&#x20AC;&#x2122;s grandchildren to sign paperwork for the motorocach that will bear his/her name above the passenger door. â&#x20AC;&#x153;We take pride in providing modern equipment and well-trained drivers who have experience in offering excellent customer service. I think that is the most important reason why we are growing today. We treat our drivers like they are family. In return, they have a great attitude when it comes to working with customers. That helps to further improve our companyâ&#x20AC;&#x2122;s reputation and bottom line.â&#x20AC;? amily businesses have played key roles over the years in the success of the North American bus and motorcoach industry. Many such operations are still family-run, with multi-generations involved. That is certainly the case for Lewis Coaches, which was started in 1960 by Earl Lewis Sr., and Noney Lewis, grandparents of Harold Lewis Jr. The company was originally known as “Lewis Bus Service,” and primarily operated school buses for various school districts in the greater New Orleans area. The company’s first motorcoach was purchased in 1980, to meet the changing needs in school transportation at that time. By the mid-1980s, many school districts in New Orleans began to provide their own transportation for students. This led Lewis Bus Service in a new direction as a company, that being charter and tour work. It eventually left the school bus segment all together. “My grandparents passed away in the early 1990s, which led to my father and mother, Harold Lewis Sr., and Barbara Lewis, taking over the business,” Harold Lewis Jr. said. “In 1991, our company’s name was changed to ‘Lewis Coaches, Inc.,’ and it’s been under active management of my parents ever since. They are now semi-retired and hold the titles of president and vice president.” The third generation of family involvement at Lewis Coaches involves Harold Lewis Jr. and his brother, Chad Lewis, who is director of maintenance at the company. www.safetyvision.com CREATE A HARMONIOUS TRANSIT ENVIRONMENT TODAY! Copyright © 2019 Safety Vision, LLC All Rights Reserved. IMG Partner of the Year! Many of the vehicles in Lewis Coaches’ fleet feature the latest in amenities, including 110-volt outlets for personal electronic devices, as well as DVD players, Wi-Fi and satellite TV, the latter of which is very important to specific charter groups, such as sports teams. Seat belts are also now available in all but one of the vehicles provided by Lewis Coaches. “Our drivers regularly make announcements before trips. This includes a personal introduction as well as addressing several safety issues, including seat belt use,” Harold Lewis Jr. said. “It’s mandatory that when we are carrying school children, each child must wear a seat belt. Chaperones help us with making sure that takes place. “For those trips involving just adults, I do see more passengers gradually coming around to wearing seat belts while in our vehicles.” One major change in technology that has affected all U.S. motorcoach operators involves Electronic Logging Devices (ELD), which are now federally mandated. “There was a learning curve to overcome for some of our drivers when the ELDs were installed, but they have all since adjusted well,” Harold Lewis Jr. said. “That technology has helped us save time as well as the paper work involved when using paper driver logs.” He added that ELDs, GPS tracking and real-time vehicle analysis have been added to the growing list of technicological advancements that are now part of the company’s fleet of modern motorcoaches. WASH BUSES FAST & EASY! Harold Lewis Jr. shared some words of advice, when asked what makes a good bus/motorcoach driver. “There is one specific characteristic, in my opinion, that is not very trainable — having a personality that works well with passengers. A good driver can properly communicate with passengers during all types of situations. This is important, as there are many different issues that can come up in the course of a trip,” he said. “My main objective when I look for a driver is that person’s personality and ability to interact. Operating a bus/motorcoach can be tough work by itself, but good driving is a skill that is trainable for most people. However, if a person doesn’t have the ability to properly interact with as many as 50 to 55 passengers at a time, then this is probably not the job for him/her. “Most trips are great, but sometimes issues do come up. Therefore, we properly train our drivers on customer service and encourage them to always take the higher ground. It’s good to work out problems in a professional manner. We find a lot of problems get resolved through the use of good communication skills. “If there is an issue during a trip, the driver will inform passengers immediately of any situation that needs addressed. The driver can also contact me about problems, such as changes with a trip’s itinerary.” Those employed to drive at Lewis Coaches participate in regularly-scheduled safety and training meetings, covering such topics as fatigue management and improved communication skills with passengers. fter nearly 60 years in business, and with members of the younger fourth generation already expressing a desire to be part of the company someday, Harold Lewis Jr., and fellow Lewis family members, are optimistic about the future. “We feel good, not only about the future of our own company, but the entire motorcoach industry,” Harold Lewis Jr. said. “I’m especially excited about the advancements being made with today’s state-of-the-art equipment. This can only lead to further growth as more people realize how advanced today’s motorcoaches have become, serving as an essential part of the overall transportation network. “This advancement in technology is also helping to attract members of the millennial generation, allowing those people to travel while using their laptops and other electronic devices. Motorcoach travel has become both affordable and luxurious. “As for Lewis Coaches, our business plan has remained the same over the years — to grow one step at a time. We are not looking to have 100 motorcoaches in our fleet within the next few years. Instead, our goal is to maintain a small company status, perhaps getting up to 10 to 15 vehicles in the near future. It’s OK to be big. I know of some great motorcoach companies that are huge and operated by very smart and gifted people. However, for me, it’s important to have that hands-on approach when it comes to daily operations, keeping it small. This has worked out very well for our company.” Harold Lewis Jr. added that he is very happy his business career path ultimately headed back toward the family business and bus/motorcoach transportation. “We (members of the Lewis family) have been born and bred into this line of work. Like anything in life, it’s good to love what you do, otherwise it just becomes another job,” he said. “The transportation business can sometimes push a person to the brink. The secret, however, is to find a way to balance the positive with the negative. That is what the Lewis family has tried to do for several generations. I think we have succeeded.” Contact: Lewis Coaches, Inc., at 504-486-3423 or visit www.lewiscoach.com. BASE A great starting point for those who prefer to complete most repairs on their own. PLUS Flexibility to get you on the road quickly. CERITFIED 51-point inspection, ready for immediate operation with included account credit. A SIMPLER WAY TO PURCHASE PRE-OWNED Easily navigate popular pre-owned makes and models across the ABC dealer network. Contact your ABC Account Manager for more informion. Transpo’s executive team includes, left to right, Controller Chris Kubaszak, Director of Human Resources Tracy Davis, Director of Operations Terry Allen, Director of Maintenance Dan Warmoth, Director of Marketing Catey Traylor and General Manager/CEO Amy Hill. 2018 to improve service and job opportunities in the Indiana cities of Elkhart and Goshen, located to the east in neighboring Elkhart County,” Hill said. “We try to be actively involved in the areas we serve. Many of our community partnerships involve introducing individuals to public transportation. For example, the Downtown South Bend organization has a ‘First Fridays’ promotion, where we offer a free shuttle to all its events. This is a great way to get someone who may not be a typical Transpo rider on the bus, and who will, hopefully, began to think about transit as a viable option.” “First Fridays” are on the first Friday of each month year-round, and includes live music, movies and other entertainment. FOCUS ON CUSTOMER SERVICE s was mentioned before, public transportation in South Bend has a long history. It began on May 25,1885, with a single, horse-drawn truck wagon. Later that year, electric streetcars began operating. Improvements in electrification led to a new generation of streetcars throughout South Bend and Mishawaka. STATE-OF-THE-ART FACILITY fter operating for 125 years in the same location, Transpo’s current state-of-the-art headquarters, the Emil “Lucky” Reznik Administration, Maintenance and Operations Facility, was opened in 2010. Reznik was a long-time Transpo board member who was instrumental in the development and design of the transit system over the years. n Recyclable materials are collected on site including paper, glass, plastic, cardboard, metal and batteries; n A monitoring system measures carbon dioxide concentration and outdoor air delivery to ensure proper ventilation; n Employees have access to natural daylight and outdoor views in most areas of the building; n Low-emitting materials chosen for the facility reduce the level of harmful volatile organic compounds (VOCs), and improve the indoor air; n The ventilation system brings in outdoor air to help keep indoor air fresh; n As buses are washed, a recycling system captures and reuses the water, reducing the need for fresh water; n As part of the LEED educational component, Transpo offers tours of the site. “Now that we have the facility side of things taken care of, we have been focusing on bringing innovation and technology to the service we provide the community,” Hill said. When it comes to technology, currently all Transpo fixed-route vehicles are equipped with internal and external cameras, as well as audio capabilities. “With that technology, we are able to fully investigate if there are any issues, concerns or passenger complaints,” Hill said. “As far as additional technology on our fixed-route buses, we just added automatic passenger counters (APCs) on all of our vehicles. Previously, only a portion of our fleet had APCs. We also launched new paratransit scheduling and dispatching software in December 2018.” In 2018, Transpo’s paratransit ridership increased nearly 12 percent. chase those vehicles.” Looking ahead, Hill reiterated some of Transpo’s goals that she mentioned earlier. “We really want to focus on increasing ridership. I feel a good way of doing that, especially to attract choice riders, involves the technology we talked about,” she said. “To continue to introduce technologies to add to our efficiency and service delivery is key. “We obviously need to continue our vehicle replacement program. Having reliable service directly correlates to the age of our vehicles, as well as the maintenance and operating costs. “We are also in the process of taking a look at our system as a whole, making sure the routes we are operating are serving and meeting the needs of passengers. A lot of our routes have been running the same for years. As the community changes, and as people are moving back to the downtown area, we want to make sure we continue to meet the needs of our riders. “Nationwide, I think there are a lot of good initiatives out there. We are very active in the American Public Transportation Association (APTA). The association has been great on the national level in advocating for public transportation across the country. “Public transportation offers a variety of careers — everything from a bus operator to marketing to finance. There are a lot of great opportunities in the transit segment.” Contact: South Bend Transpo, 1401 S. Lafayette Blvd., South Bend, IN 46613. Phone: Information line, 574-233-2131. Email: businfo@sbtranspo.com. Website: www.sbtranspo.com. able today. Also important is working closely with manufacturing to monitor quality during production, while ensuring seats meet Amaya-Astron’s in-house standards. “Amaya-Astron seats have also been designed with passenger comfort in mind. This comes with a commitment to not only improve on our existing models, but also to introduce new models meeting the ever-changing demands of today’s motorcoach passengers.” According to the company, “Amaya-Astron seats focus on ergonomic design, allowing for more hip to knee room and thus more legroom overall. The introduction of the newest SIGMA model increases the legroom because of its thinner seat back design, while maintaining the hip to knee comfort in the seat cushion. There are many options available. The most common of these are automatic footrests, grab handles, airline style and flip-up tray tables, cup holders, mesh magazine pockets, and 110V outlets. Amaya-Astron also offers luxury seating options, such as its 2+1 seats. “Offering a variety of different seat models and types is just one of the many ways Amaya-Astron works to keep ahead of the market. Amaya-Astron seats come with a three-year warranty from the factory.” For inquiries in the United States and Canada, contact George Farrell at gfarr007@aol.com, Bob Greene at bgreene45@cox.net or Jeff Goldwasser at interiors@jeffgoldwasser.com. These representatives serve the North American motorcoach industry, providing aftermarket sales, service and support. Donovan Albarran can be contacted at the company’s Mexico City headquarters at +52 (55) 5881-2007 or by e-mail: donovan@amaya-astron.com.mx. Also visit www.amaya-astron.com.mx for more information. Panel moderator Brian Walter, far left, and UMA representatives Stacy Tetschner, Becky Weber and Ken Presley discuss legislative and regulatory issues. another key focus point for UMA officials and the board of directors, he added. For example, UMA is partnering with Truckers Against Trafficking (TAT) - Busing on the Lookout (BOTL) to help combat human trafficking. The organization had a booth at this year’s UMA EXPO tradeshow floor. “What is the No. 1 thing we do in our business? We help transport humans. Who better to be on the lookout than a driver when it comes to those situations where a trafficker may be sending a victim from one location to another through bus travel,” Tetschner said. He added that representatives from TAT/BOTL can provide the necessary training to help drivers spot signs of human trafficking. An array of educational sessions were available for attendees during this year's UMA EXPO, in Fort Lauderdale, FL. The UMA EXPO Sneak Preview After-Party took place on a beach at a nearby state park. Our buses are purpose built for tours, assisted living, public transit, shuttle markets and much more. All Buses Available with Lift-Equipped Options. 5Star Specialty Programs: The Cost Of Vehicle Crashes otor vehicles are an indispensable part of the lives of most Americans. They are also a source of crippling injuries and death. information will lead to reduced losses in the fleet. Preventing crashes is the goal of fleet safety programs, but not all crashes will be eliminated. When these crashes happen, uncovering the root cause is important for proper claim adjudication. Electronic recording of the crash sometimes provides evidence that can expedite the determination of fault. This allows prompt settlement of disputed events, and can result in reduced claim settlements. When a crash occurs, the unbiased evidence of electronic recordings will reduce investigative expense and settlements. 10 Mistakes Made Most Often By Employers Trying To Control Losses 1. Failure to assign responsibility to one person: The buck has to stop somewhere, and unless one person feels the need to do something, loss control is left to a committee of people. This is sure to spell disaster through inaction. Make sure that one person has the authority or influence to get the job done. 2. Failure of top management to be committed to loss control: Usually this is due to the things management doesn’t appreciate — that safety saves money, that a safe company is a well-managed company, and that management can efficiently improve the loss control record every time by following good loss control methods. The bottom line is, if top management isn’t pushing the program, it won’t happen. 3. Failure to clearly state the program’s objectives and management’s loss control policy: This goes beyond hanging a written statement on a wall. Every time a supervisor makes a decision, the policy swings into action. Thus the burden is on top management to make sure that all levels of supervision understand what is expected of them in loss control. 4. Failure to recognize loss control as a line management responsibility: Giving one person the title of Safety Coordinator does not remove that responsibility from each department head in the organization. Loss control is not an add-on function, but simply the essence of good management from top to bottom. 5. Failure to measure the effectiveness of the program: Efforts to improve loss control do not stop with naming a Safety Coordinator. Top management must demand results, and then challenge the Safety Coordinator to do better each time. 6. Failure to provide adequate training: 95 percent of accidents are caused by unsafe acts of people. Never assume a worker knows what to do. Experience doesn’t always mean wisdom or good sense. 7. Failure to control losses after the fact: This is the difference between safety and loss control. So little is done in this area by employers that it’s like a secret. Invest in these secrets before the fact. Profit by them after the fact. 8. Failure to recognize the economic impact of poor safety: Companies pay increasing premiums due to poor accident experience. Hidden costs (damaged material, equipment, down-time, interrupted work, etc.) can run four times the amount paid by the insurance carrier. 9. Failure to enforce safety rules uniformly: Once a worker is trained to do a task properly, management must see to it that he/she performs as expected. Safety rules are minimum performance standards that must be applied uniformly and consistently. 10. Failure to set up an accountability factor for all levels of management: Once department heads, supervisor and the labor force are trained and given their responsibilities, there needs to be a follow-up on accountability of their actions. This needs to be documented. Visit www.5starsp.com for more information. 5Star Learn more at 5starsp.com © 2018 5Star Specialty Programs is a division of and operates under the licenses of CRC Insurance Services, Inc., CRC of California Insurance Services, CA Lic No 0778135. No claim to any government works or material copyrighted by third parties. Nothing in this communication constitutes an offer, inducement, or contract of insurance. Financial strength and size ratings can change and should be reevaluated before coverage is bound. This material is intended for licensed insurance agency use only. This is not intended for business owner or insured use. If you are not a licensed agent please disregard this communication. n insurance company with a long-term commitment to your industry, the best claims handling, and leading safety and compliance resources available, can be the difference in your business, now more than ever. For over 30 years, we, at Lancer, have explained to the readers of Busline Magazine why it’s so important for bus and motorcoach companies to partner with an insurer that truly understands the intricacies of their industry. This certainly holds true in 2019 as much as it did in 1985, when we insured our first bus insurance policy, and will only grow in significance as the severity of claims continues to escalate. Driver shortages, medical inflation, new science, an emboldened plaintiffs’ bar, rising vehicle values, public (mis)perception, increased regulatory and compliance burdens and a host of other factors continue to exert influence on risk. More recent trends like increasing miles driven, low fuel costs, distracted driving and increased marijuana usage also come into play in driving up costs. Managing these factors will continue to challenge bus and motorcoach operators — and their insurers — for the foreseeable future. We encourage industry stakeholders to be proactive in addressing both the ever present and emerging risks. It’s important to utilize the many new forms of technology available to help manage almost every single aspect of your business, and to take advantage of every opportunity to offer your opinions to regulators and legislators — both through trade associations and on your own behalf. From the vantage point of an insurer completely dedicated to the transportation industry, we know every effort counts. The headwinds facing the transportation industry are getting stronger every day. An insurance company with a long-term commitment to your industry, the best claims handling reputation, and the best safety and compliance resources available can be the difference in your business, now more than ever. Contact: Lancer Insurance, 370 W. Park Ave., P.O. Box 9004, Long Beach, NY 11561. Website: www.lancerinsurance.com. ords of wisdom are sometimes hard to come by, especially during tough times. Those who provide passenger transportation, however, are seeking advice on insurance and other industry-related matters at a rapid pace. Choose A Solid Partner With A Long-Term Commitment To Your Industry As Your Motorcoach Insurer RLI Transportation is based in Atlanta, GA, and is a division of RLI Insurance Company. We are a full-service provider of insurance products and services for public auto, truck and commercial auto customers. Our founding (and current) principles are to provide outstanding claims and customer service, responsive and creative underwriting and unmatched financial strength. RLI was also rated in the top 10 carriers in a 2017 survey of independent agents conducted by National Underwriter Magazine and the National Association of Professional Insurance Agents, underscoring our commitment to outstanding service to our customers and agents. RLI Transportation’s history of financial stability, extraordinary claims handling and creative underwriting assure our customers and agents that we are dedicated to meeting their needs. If you have a risk that meets our criteria, please feel free to contact us. We look forward to building a mutually-rewarding partnership. Contact: RLI Transportation: Tim Hathy - Vice President, 888-754-4221, 2970 Clairmont Rd., Suite 1000, Atlanta, GA 30329. Websites: www.rlicorp.com/public-transportation and www.rlicorp.com. Committed To The Transportation Industry, And Only This Industry TIB Transportation Insurance Brokers is the largest agency in the country dedicated solely to the transportation industry. Headquartered in Glendale, CA, with offices in Minneapolis/St. Paul, Orlando, Baltimore, Chicago, Lometa, and New York, TIB serves more than 5,000 bus and limousine clients nationally. It’s committed to the transportation industry, and only that industry. All of its clients have commercial auto exposures with the vast majority being certificated carriers. At TIB, tough transportation insurance problems are handled every day. The company is staffed to provide clients with the finest service of any broker in the industry. TIB’s goal is to work together as a team to take care of clients. It offers high quality services, trouble-free relationships and rapid response to a customer’s needs through the strength of TIB’s national network. TIB’s specialization and commitment to the transportation industry ensures that by focusing only on this marketplace, it can devote the energy and resources necessary to be at the leading edge of the transportation insurance field. All clients have their own personal account executive. In addition, they are provided with an assistant account executive to handle their standard requests such as certificates, endorsements, filings, etc., and an accounting representative who knows their exact premium status. Clients always have total access to TIB’s corporate management team, who can provide assistance for a client’s risk management needs. The transportation industry has traditionally experienced problems securing programs which provide adequate coverage and competitive pricing. As brokers, TIB works for the clients, explaining the various plans and programs and helping them determine the insurance policies which best suit their needs. TIB is not captive to a single insurance company; therefore, it can offer options and alternatives, rather than providing a client with one — and only one — insurance program. TIB is keenly aware of changes in the marketplace because the company is there, immersed in it everyday. Obviously, change is a part of the environment, and indeed, a dynamic force affecting all of us. TIB’s goal is to always be on the cutting edge — to discern the good from the potentially damaging; to keep the concerns and goals of its clients foremost in its actions and reactions to the times. All of TIB’s accounts are important to the company, no matter what their size, starting with the largest customers right down to individual owner/operators. The success of each and every one of these customers is an integral part of TIB’s success — this fact is always on the minds of TIB professionals as they serve the company’s client base. RRL Insurance, located in Florida and Ohio, specializes in commercial insurance and risk management services. Our professional team has built a solid reputation with years of in-depth knowledge in the transportation industry, and is constantly enhancing our contacts with insurance companies and insureds. In 2014, RRL became partners with Acrisure. We have 300-plus agency partners located in most states, with $10 billion-plus in sales. We work with well-regarded companies that are very competitive in the marketplace. We are responsive to our clients’ needs, and offer a comprehensive insurance program which makes us your partner in reducing accidents and premiums. Our goal is to provide clients with cost effective insurance and risk management solutions, combining competitive rates with superior service and exceeding expectations. All of our clients have a personal account representative to handle their standard requests — such as certificates, vehicle changes, filings, etc. Clients have total access to RRL’s management team, which can provide assistance for risk management needs 24/7. We are here for our clients on the go, with access to clients’ insurance and requested documents instantly online or from a smartphone or tablet. Solid insurance industry relationships, and dealing with markets by understanding the issues at hand, keeps RRL ahead of the curve. It’s not always enough to identify the areas needing improvement. You actually need to invest the time and resources to make those improvements. RRL is very good at being proactive, not reactive. Much like RRL, if the industry as a whole is proactive in lieu of reactive, rates will drop as claims continue to drop. RRL works to place your operation with a strong market that will be a partner with you, at a cost-effective rate. There is a reason why RRL customers do not leave once they are here, with top notch service and knowledge, the rest just falls in place. Give us a call. We are here to become your loyal partner in securing all of your insurance needs. Visit www.rrl-ins.com for more information. Louisville Set To Host The APTA 2019 Mobility Conference The 2019 Mobility Conference: The American Public Transportation Association’s (APTA) enhanced Bus & Paratransit Conference is scheduled for May 19-22, at the Omni Louisville Hotel Convention Center, in Louisville, KY. According to APTA, the conference will address the critical priorities and challenges facing bus and paratransit systems, while exploring the changing environment in which systems operate in today’s mobility landscape. Events include the Maintenance Managers Workshop, Bus Rapid Transit (BRT) Tuesday sessions, National Transit Institute training courses, Bus Display, Products and Services Showcase, and technical tours. APTA expects the conference will be attended by bus and paratransit system employees and managers, mobility managers, board members, contractors, suppliers, manufacturers, and consultants. The program of educational sessions is currently being organized by the following six routes of study: n Route 1: Mobility & Access; n Route 2: Vehicle Technology; n Route 3: Bus Rapid Transit (BRT); n Route 4: Planning, Operations & Maintenance; n Route 5: Safety, Security, Risk Management & Emergency Preparedness; and, n Route 6: Transit’s Future Workforce. Visit www.apta.com/mc/bus/Pages/default.aspx for updated session and speaker details. The following program schedule is preliminary and subject to change. APTA’s members are public organizations that are engaged in the areas of bus, paratransit, light rail, commuter rail, subways, waterborne passenger services, and high-speed rail. Members also include large and small companies who plan, design, construct, finance, supply and operate bus and rail services worldwide. Government agencies, metropolitan planning organizations, state departments of transportation, academic institutions, and trade publications are also part of its membership. FOR MORE INFORMATION, VISIT WWW.APTA.COM. Bus & Paratransit Conference May 19-22, 2019 Omni Louisville Hotel Convention Center in Louisville, KY.
Simplify your transition to a zero-emission fleet with the longest-range electric buses and comprehensive charging solutions. De Leo Transportation Fabrics, a division of the Edward B. De Leo Company, Inc., which was established in 1962, continues to deliver exceptional service and product to the automotive, transportation and upholstered furniture manufacturing industries. Working with our manufacturing partner Epengle Tekstil, DLT offers high quality moquette velvets, flat woven fabrics and vinyls for bus, motor coach and light rail to public and private transportation industries. With 100 + years combined De Leo and Epengle have provided a variety of pile compositions including 85/15, 30/70 wool blend, 100% Polyester, 100% Acrylic and 100% polyester flat woven to meet the highest standards of the transportation industry. All qualities meet the International FR requirements as well as FMVSS-302. Specialty and custom design work is available to fit your needs along with anti-bacterial, stain repellent and water proofing finishes. You can expect short production lead times, excellent New Jersey-based customer service and on-time deliveries. Warehousing in South Carolina offers quick shipping and easy logistics. Visit www.deleoTF.com today to view our current stock program. Chestnut Ridge Foam CR SAFGUARD® XL seat cushioning combines fire-resistance with durability. Traditional FMVSS 302 cushioning burns profusely when exposed to minor open flame sources. The rapid spread of flames with this minimum requirement poses a serious danger to ridership, particularly, those with mobility challenges. CR SAFGUARD® XL offers a high level of fire-performance that minimizes the hazards of cushioning as the largest fuel source, reducing both risk and liability. For detailed cushioning designs, TRAX® advanced fireresistant molded cushioning is the ideal solution for accomplishing modern cushioning designs in combination with a high level of fire performance. The molding process allows for multiple contours within a seat design TRAX® Molded to achieve an impressive and distinct appearance. This Cushioning Assembly process also eliminates costly waste and labor associated Courtesy of Freedman Seating with cut-to-shape cushions and provides dimensional accuracy for repetitive parts. CR SAFGUARD® XL and TRAX® are fully compliant with F.T.A. fire performance criteria verified through internal testing capabilities. Offered in gas or diesel, recent tests demonstrate an impressive dayto-day fuel economy of up to 38 percent compared to other shuttle bus chassis. The transit chassis also offers an encased capless fuel filter and an improved engine compartment layout, in both 3.2 diesel and 3.7 gas litre engines, that are proven worldwide. In addition to many of the Micro Bird body benefits such as the reinforced structure and the superior insulation, the CT-Series wide center aisle creates more room for passengers enhancing the comfort. The design offers optimised driver ergonomics, and the overall look of this vehicle is comtemporary and stylish. Micro Bird Commercial designs and manufactures a complete line of commercial buses built with superior durability. The CTS-Series delivers exceptional safety and stability, making this bus an excellent choice for special needs applications. This bus is ready to be equipped with a variety of options to suit the needs of any passenger, disabled or not. The CTS-Series (CT-Series) offers more visibility and a more comfortable driverâ&#x20AC;&#x2122;s area, with easy access to controls. The double-leaf wheelchair doors offer protection on both sides of the lift, thus adding to passenger safety, while offering superior weather seal and door strength. Model ..................................................................................................CTS-Series Seating Capacity ............................................................Up to 11 passengers Length ............................................................................................................273â&#x20AC;? Width ................................................................................................................86â&#x20AC;? Height .............................................................................................................106â&#x20AC;? Engine........................................................................3.7L V6 or 3.2L I5 Diesel Transmission ......................................................6 speed AOD w/Selectshift Chassis ..................................................................................Ford Transit T350 Air Conditioning........................................................................Up to 55K BTU Wheelchair lift.....................................................................................Standard Steering.........................................................................................Tilt-Standard Suspension......................................................................................Leaf Spring Wheelbase......................................................................................................156â&#x20AC;? The D-Series is a dual-rear wheel bus, made of six longitudinal structural beams, combined with one-piece galvanized steel roof bows that enhance safety and rollover protection. This mid-size bus can be built to accommodate various types of configurations, seating up to 28 passengers (Ford chassis). Micro Bird buses are purpose built for tours, assisted living, public transit, shuttle markets and many more. Several options such as luxury seats, extra wide rearview window, flat screen TV, and panoramic windows, are offered to enhance a riderâ&#x20AC;&#x2122;s experience. Alternative fuel propane and electric systems are also available. The DS-Series, a dual rear wheel special needs vehicle, delivers superior safety and a smoother ride because of the energy absorbing blocks that absorb the road vibration. Micro Birdâ&#x20AC;&#x2122;s recessed wheelchair tracks, Slide Nâ&#x20AC;&#x2122;Click or floor pocket anchorages, offer safe and secure transportation for special needs passengers. The double-leaf wheelchair doors offer protection on both sides of the lift, thus adding to passenger safety, while offering superior weather seal and door strength. Model.......................................................................................................D-Series Seating Capacity...........................................................Up to 28 passengers Length..................................................................................From 257â&#x20AC;? to 346â&#x20AC;? Width.................................................................................................................96â&#x20AC;? Height..................................................................................................111â&#x20AC;? or 113â&#x20AC;? Engine ..............................................................Ford 6.8L gas or GM 6.0L gas Transmission ................................................................................6-Speed AOD Chassis.............................................Ford E350 & E450 or GM 3500 & 4500 Air Conditioning........................................................................Up to 82K BTU Steering.........................................................................................Tilt-Standard Suspension....................................................Leaf Spring - Mor/Ryde or Air Wheelbase ............................................................................From 138â&#x20AC;? to 216â&#x20AC;? Spirit Of Equess ARBOCâ&#x20AC;&#x2122;s Spirit of Equess, a low-floor transit bus built on an ARBOC Specialty Vehicles, LLC, purpose-built chassis, can accommodate up to 33 seated passengers or 6 wheelchair passengers. This bus is fully accessible with a fully flat floor and no steps throughout the bus. ARBOCâ&#x20AC;&#x2122;s advanced technology exceeds ADA guidelines with a 1:8 ramp slope and 39-inch door opening for passengers in need of extra assistance and wheelchair accessibility. This 10-year bus utilizes heavyduty ZF axles, which allow plenty of GVW for extra standees. Spirit Of Independence Ford Built on the fuel-efficient Ford transit chassis, the Spirit of Independence offers a low cost of ownership while maintaining the safety and dependability that is expected from ARBOC. The 96-inch wide body allows for easy maneuverability inside the vehicle. It also features dual rear wheels with rear wheel drive. With a GVWR of 10,360 pounds, and an available passenger capacity of up to 14 ambulatory or 5 wheelchairs, the Ford Spirit of Independence is ideal for transit agencies that are looking for smaller low-floor buses. Backed by the reliable Ford dealer network, the Ford Spirit of Independence touts convenience and ease of serviceability. Spirit Of Independence RAM ProMaster The Spirit of Independence on a RAM ProMaster cutaway chassis, boasts a short wheelbase and a tight turning radius that navigates well in narrow streets and parking lots. Equipped with large passenger windows, offering considerable visibility, and seating up to 12 ambulatory passengers and three wheelchairs, the Independence is available with an 80-inch wide body or a 96-inch wide body. This bus is perfect for use as a hotel shuttle, airport parking shuttle, in non-emergency medical transport or for assisted living. The RAM chassis features single rear wheels with front wheel drive. With a GVWR of 9,350 pounds, this bus requires 3 point seatbelts and features a smaller 21-foot body, which handles with ease. Occupants will appreciate the absence of steps or a ramp inside the vehicle and the superior headroom. Spirit Of Mobility The ARBOC Spirit of Mobility is built on a conventional GM cutaway with all passengers entering through the same 39-inch wide door opening. The interior offers theatre seating for better viewing for all riders. The Spirit of Mobility low-floor bus offers a full air-ride suspension with a beneficial kneeling feature, allowing for an entrance of less than 5-inches from the curb without deploying the ramp. The Spirit of Mobility provides a single, non-discriminatory angled and accessible entranceway. Riders of all abilities no longer need to contend with steps in the most accessible cutaway bus in the industry. Every passenger, including wheelchair riders and those in power scooters, can experience what true equal access means. Now available on a Ford E450 chassis. The Spirit of Freedom, built on the GM4500 cutaway chassis, utilizes General Motorsâ&#x20AC;&#x2122; standard suspension to create a low-floor, ADA-compliant bus capable of a 1:5 ramp angle; all with an exceptionally low price point. Utilizing the GM suspension drives down maintenance costs over the life cycle, making it comparable to any standard floor cutaway. The spacious 39-inch entranceway and low step height make this an ideal bus for airport and hotel shuttles, as well as transit agencies. Passengers of all mobility capabilities, including those using walkers, can experience what equal access for everyone truly means. Now available on the Ford E450 chassis. The fully-accessible, low-floor Spirit of Liberty is a medium-duty 29to 34-foot rear engine shuttle bus. The Liberty features an open floorplan with no steps throughout the passenger area. Standard wheelchair zones are a spacious 54 x 30 inches. Passengers enter on a 34-inch wide, 1:8 sloped ramp (rated at 1,000 pounds) to a 37-inch pass-through between front wheelhouses. The Liberty incorporates lightweight technologies and proven ARBOC construction, resulting in best-in-class curb weight of 19,500 pounds. With a GVW of 25,990 pounds, the Liberty has the capacity to carry up to 37 passengers plus standees. Power is supplied by a 6.7 liter Cummins ISB diesel engine, coupled to an Allison B220 six-speed transmission on a proprietary chassis supplied by Freightliner Custom Chassis Corporation. CNG option is coming soon. Home of the Best Full-Service Travel Plaza in Northern Illinois Featuringâ&#x20AC;Ś Ford Transit Small Bus With Wheelchair Lift Options The Ford Transit Small Bus from TransitWorks gives a traditional bus door walk-in entry which saves money on upfit and fuel economy over traditional cutaways. Benefits include: Built on the Ford Transit 350 with 144-inch long wheelbase and extended body; 3.7L V6 engine with 275HP; 38-inch wide doorway with built-in steps that are perfect for shuttle or transporter use; 84-inch high door opening that offers maximum clearance and more room for entry and exit; bus door features remote for quick and easy operation from the driver seat, or outside the vehicle to allow driver to better assist passengers entering and exiting the vehicle; seats up to 15 passengers, including driver; rear lift available for wheelchair transport; can hold up to four wheelchairs; and, exclusive SmartFloor flexible flooring system that allows moving and removing of seats to bring over 1,000 seating layout options. Super Salad Bar by-the-pound! Stromboli, Pizza, Pasta & more! Hand-Dipped Ice Cream! Bus Drivers & Tour Guides Eat free! Mini-Mall â&#x20AC;&#x201D; 2 Stores with over 5,000 sq. ft. of shopping! Driving Results, a provider of industry peer groups for the luxury ground transportation industry, is now offering a new educational group for strictly bus education. “With the continued rise in the bus category, luxury ground transportation companies are now expanding their fleets into this market. Driving Results recognizes the need to help guide and educate these companies. After many requests for direction and advice in this fast-growing market, Driving Results is introducing its new educational group, ‘BIG Wheels,’” according to the company. “BIG Wheels will offer educational opportunities to help companies expand their bus business. Members of this educational group will consist of owners, general managers, operation managers or fleet managers. Each company must have a minimum of 10 buses in their fleet (14-plus passengers), a current DOT number and be in satisfactory status to be accepted into this group.” The group will be co-facilitated by Managing Partner Arthur Messina and Educational Partner Tom Holden, of Rose Charters. Messina added he believes many companies that have ventured into the bus market will join and see the benefits of this specialized group. The BIG Wheels group will launch in 2019, and will require companies to pass an application process in order to join. Contact Driving Results at 631-584-2273 or email Arthur@drivingresults.org. For the past six years, Driving Results has assembled peer groups within the transportation industry. With two groups focusing on affiliate managers and three groups for owners/general managers, Driving Results has a limited number of openings for new members. Driving Results also maintains a waiting list for companies looking to join any of the existing sold-out groups. It strives to help companies build their businesses through networking, best practices, relationship building and education. The group meetings focus on many topics that help increase profits, while driving sales and creating efficiencies. Visit www.Drivingresults.org for more information. FL, and will open dedicated service centers in New Jersey, Illinois, Texas and California. setting a customer-centric foundation for major growth in the years ahead.” “In addition to product quality and a clear focus on the customer, TEMSA is known in the commercial vehicle market for a steady stream of innovation and for its strides to support smart city initiatives,” according to the company. “TEMSA represents one of the few automotive manufacturers offering alternative models of electric coaches, with two vehicles ready for serial production, and plans an autonomous bus for 2022.” “Our focus on the changing needs of bus operators and passengers is making TEMSA one of the most sought-after transportation brands in the world,” Yildirim said. “We look forward to building upon our tradition of product excellence to capture the increasing demand for both coach buses and for TEMSA’s transit buses, which will help us serve even greater numbers of customers across America.” Visit www.temsa.com for more information. Nevell Group, responsible for assisting in the management/administration of the company’s corporate safety program where he coordinated the training of workers on safety law and regulations, conducted job site safety inspections and managed safety documentation. With a Bachelor of Science degree in physics from Sacred Heart University, Matute has received numerous industry training credentials. Since it first opened in 2013, the Lancaster manufacturing plant has grown from 106,000 square feet and a workforce of a few dozen to a facility that now covers more than 546,000 square feet and employs more than 700 workers. “The firm is the only electric vehicle manufacturer in the U.S. to have an allunion workforce. BYD’s diverse plant workforce is currently comprised of 85 percent minority employees,” according to the company. Visit www.BYD.com for more information. the J4500e and D45 CRTe LE, followed by the rest of MCI’s model range with a focus on public transit and employee shuttle segments. The electric architecture incorporated in the MCI J4500e features a high-torque Siemens 2130 LB FT electric drive system, with a planned range to meet long-distance applications, and a Nickel Manganese Cobalt (NMC) battery at 450 kWh, with a high power plug-in battery to fully charge in under three hours. MCI will also apply its battery-electric platform to the D45 CRT LE Commuter Coach, followed by the electric 35-foot MCI J, giving operators a comprehensive choice in purpose-built, all-electric coaches. “Overall, the MCI 35-foot J3500 was developed as a result of listening to customers, with a coach to fit smaller groups,” according to the company. “Sharing all the styling, performance and maximum parts commonality with the 45-foot MCI J4500, the new MCI J3500 seats up to 44 passengers with best-in-class interior, the largest baggage and payload capacity among all 35-foot vehicles and again, top maneuverability. The J3500 allows our operators to explore new revenue opportunities with an easy transition into their operation, featuring common parts, interior and driver’s area.” “We enjoyed an extraordinary UMA Expo that included a lot of product and service news for our operators,” MCI President Ian Smart said. “For the last three years, MCI has consistently met product innovation targets and delivered steady improvements in manufacturing, customer service, parts and training. Our team at UMA was able to discuss what was in our booth, what’s arriving in the next 18 months and longer-term initiatives.” Visit www.mcicoach.com for more information. train and supporting components,” according to ABC Companies. “In addition to the long-term value of battery-electric buses, we are proud to bring a truly zero-emissions solution to our industry,” ABC Senior Vice President, Commercial Operations, Jay Oakman said. “While Van Hool and Proterra bring laser-focus expertise to the design-build aspect of the project, the crucial aspects of charging and infrastructure are also well-supported via Proterra’s scalable and proven depot charging system.” Adopted by major OEMs in automotive, transit bus and coach bus industries, Proterra offers multiple solutions that fit individual user demands for charging requirements. For the CX45E, powering up is a simple as plugging in a standard J1772CCS Type-1 charger. The CX45E All Electric prototype is currently undergoing field and bench testing to optimize performance and reliability. Information regarding performance range, battery-reliability and charging, as well as numerous simulations that replicate real-world conditions and applications are being compiled as tests are completed and validated. Comprehensive results and reports from Phase I testing can be accessed through ABC’s Commercial Group. Those people interested can contact their ABC account representative to request a confidential presentation and findings. A prototype of the Van Hool CX45E is slated for debut in the U.S. by Q4 of 2019, with production models available for customer delivery following shortly thereafter. The ABC Companies management team and sales engineers, along with Proterra representatives, were at the 2019 UMA EXPO, in Fort Lauderdale, FL, to answer questions and provide more information about the Van Hool CX45E. The CX45E introductory video can be viewed at www.abc-companies.com. Houston-Galveston Area Council (HGAC), and General Services Administration (GSA), as well as state contracts with Georgia, Minnesota, Pennsylvania, Washington, Arizona, New Mexico, Colorado, California, New York and Virginia. ARBOC is a North American low-floor, body-on-chassis (cutaway) bus manufacturer, serving transit, paratransit and shuttle applications. “With more than 3,000 buses produced, ARBOC leads the low-floor cutaway bus market by providing unsurpassed passenger accessibility and comfort. ARBOC also offers the Equess and Liberty, medium-duty buses for transit and shuttle applications,” according to the company. Approaching its 95th anniversary, Prevost held its “Big Reveal” including refreshed styling, design enhancements and new componentry on three coach products during the 2019 UMA EXPO. tight spaces; exterior perimeter lighting for improved visibility at the curb and luggage bays; and the Icomera onboard entertainment system that allows passengers to control their own entertainment wirelessly. Volvo 9700 — Options Add Versatility “The Volvo 9700 coach has always delivered affordable luxury and functionality,” said Tremblay. “New options are now available.” They are: n Adjustable Seat Tracks: The new tracks — standard beginning with the 2019 model — allow operators to configure the seats to accommodate a specific number of passengers at any time. Each seat slides easily in its track — or can be removed entirely. n Second Entry Door: There’s now an option to purchase the Volvo 9700 as a twodoor shuttle. Fitted into the mid-section of the cabin, the second door allows passengers to board and deboard the coach with greater efficiency. There is space for a wheelchair lift to fit beneath the stairwell. It can be installed during production or as an aftermarket upgrade. Also, the onboard restroom, with a two-tank freshwater flush system, is situated off the mid-door entrance. n North American–style Mirrors: European-style rearview mirrors mounted high on the front panel are a standout feature on the Volvo 9700. However, beginning with the 2019 model, customers have the option for a lower North American placement mirror — previously available only as an aftermarket switch-out. Visit www.prevostcar.com. The New York Public Transit Association’s (NYPTA) Hall of Fame recently honored Gordon Nevison at the organization’s 2018 Public Transit Conference, in Albany, NY. Nevison is a manufacturers’ representative for Midwest Bus Corporation and Byk-Rak LLC. He is also the former president of The Nevison Group. Nevison has worked in the transit industry for more than 43 years. He established one of the first transit management companies in Canada, and is a founding member of the CanaGordon Nevison dian Transit Heritage Foundation. “Nevison impacted transit through his work with several OEM manufacturers in North America, and has been a mentor to many successful transit executives by sharing his knowledge, expertise, integrity and work ethic,” according to NYPTA. “He joined NYPTA as one of its first corporate members in 1981 under Bus Industries of America (Orion). Over the years, Nevison was a member of several committees, and served as a board member and co-chair of the corporate committee for more than a decade. He was instrumental in developing the format for the association’s fall conference and expo, as well as supporting the event.” Visit www.midwestbus.com for more information. Motorcoach manufacturer, Motor Coach Industries (MCI), also produces conversion shells and sells parts and pre-owned equipment, along with having a network of service facilities in place. Supplying various types of insurance services to the transportation industry is 5Star Specialty Programs. Shown, left to right, are Tara Carmody, commercial underwriter - public auto program; and Tammy Houston, manager. ProAir is a manufacturer, distributor and installer of air conditioning and heating systems to the specialty vehicle industry. Shown is Kyle Lucas, warranty administrator. CBM US Inc., supplies spare parts for motorcoaches, buses and trams. Shown, left to right, are Walt Supplee, sales manager; Mathias Urban, director; and Robert Khanoyan, marketing director. Prevost Lancer Insurance Company Among the various product offerings for the transportation industry from Lancer Insurance Company are bus and limo, general and physical damage insurance. As a manufacturer, Prevost offers a product and service lineup that includes motorcoaches, conversion shells, parts and repair resources, as well as customer and warranty support. Vanner Inc. Among the products provided by Vanner Inc., are inverters and converters. Shown, left to right, are Doug Adams, North American bus market manager; Pete Duffy, senior electrification engineer; Steve Funk, president; and Chris Collet, vice president of heavy duty bus and bus electrification markets. Motorcoach Tire Sales, LLC Motorcoach Tire Sales, LLC, supplies tires to the North American tour bus and motorcoach industry. The company partners with select major manufacturers. Shown is Bill Kaiser, president. Complete Coach Works (CCW) offers collision repair, interior rehab, fleet alternative fuel conversion and vehicle remanufacturing to the bus and motorcoach industry. Shown is Jay Raber, regional sales manager. Sardo Bus & Coach Upholstery ABC Companies An exclusive U.S. distributor of new Van Hool products, ABC Companies also specializes in collision repair, financial services, parts and used bus sales and offers various service facilities. Services and products available from Sardo Bus & Coach Upholstery include seat cover replacement, upholstery and refurbishing work, flooring materials and fabrics for the bus and motorcoach marketplace. On-site installations can be provided by the companyâ&#x20AC;&#x2122;s mobile road crews. Transportation Insurance Brokers (TIB) BITZER BITZER supplies the bus and motorcoach industry with air conditioning parts and systems. Shown are Natalie Van Dyke, transport sales manager for North America; and, Alexandre St-Charles, regional sales manager for Quebec and the Atlantic provinces. Among the types of insurance provided by Transportation Insurance Brokers (TIB) are bus & limo and workersâ&#x20AC;&#x2122; compensation. Shown, left to right, are Tom Foley, regional vice president; Brandon Freigher, director of sales; James Wishengrad, account executive; Charles Brower, regional vice president; Jeff McAnany, executive vice president; and Ben Cook, account executive. Among the various products provided for the bus and motorcoach industry by AngelTrax are vehicle monitoring systems and video surveillance equipment. Shown are Eddie Dixon, national sales manager; and Janis Williams, Florida sales executive. J&J Chemical Co., supplies bus washing products including brushes and chemicals; interior bus cleaning items; odor control products; and chemicals for toilets. Shown, left to right, are Jaiker Cham, Latin America/Caribbean sales manager; and Todd Brooks, customer service manager. Shriver Transportation Insurance Agency, LLC Irizar USA LLC A manufacturer and supplier of various types of buses and motorcoaches is Irizar USA LLC. The company also supplies parts as well as customer service, financing and warranty support. Shriver Transportation Insurance Agency, LLC, provides different types of insurance including bus & limo, physical damage and workers compensation. Shown, left to right, are Chris Lang, account executive; and Michael McDaniels, vice president. Relational Bus Systems (RBS) Relational Bus Systems (RBS) provides computer software systems, consulting and training for the bus and motorcoach marketplace. Shown, left to right, are Chris Barown, senior software engineer; Laura Horvath, tour specialist; and Jonathan Mead, software engineer. Thermo King Corporation Thermo King Corporation provides HVAC systems for such vehicles as buses and motorcoaches. Shown, left to right, are company representatives Steve Johnson and Neil Tamppari. Dixie Electric A supplier of alternators, generators and starters for the bus and motorcoach industry is Dixie Electric. Shown, left to right, are Dennis Kirby, U.S. sales manager; and Phil Simpson, territory manager. BYD Motors Inc., provides a variety of motorcoach and transit bus vehicle options. The company also supplies parts as well as customer service, financing and warranty support. RRL Insurance provides insurance products to companies across the country. This includes charter bus, public livery and limo insurance. Shown is Paul Zizzo, CEO. BCE srl produces electric and pneumatic door opening devices for buses. Shown, left to right, are company representatives Paola Bonetto, Claudia Bonetto and Jessica Cellura. Among the products and services provided by the BRC Group for the bus and motorcoach industry are collision repair, parts, and vehicle painting and refurbishing. Shown is Brad Field, president. Samsara Among the products from Samsara for the transportation industry are cloudconnected cameras that provide complete video visibility. Shown, left to right, are Priscilla Liu, campaigns manager; Jenna Lawson, event marketing manager; Angelina Elhassan, team manager, field and event marketing; and Jessica Whitney, field marketing manager. A supplier of various types of lifting and maintenance equipment, along with parts, for the bus and motorcoach industry is Stertil-Koni USA, Inc.